Oliver Goldsmith Yuhu (1966) - White Need Help? Now after several decades and many requests Oliver Goldsmith has re-released the YUHU. A true to form down to every last rivet, this is a showstopper if ever there was one. Worth noting, each frame comes complete with a luxe leather snap case specially made for the release. 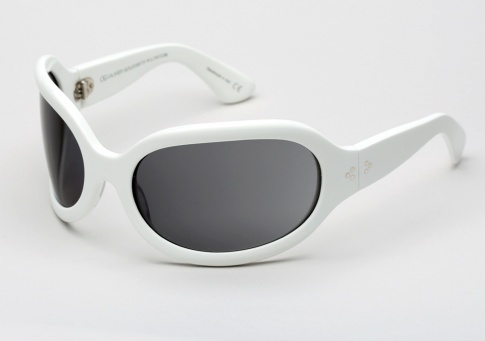 This is a limited edition sunglass, with only 200 pairs of each color being made. It is offered here in White paired with grey lenses -- the same stunning colorway Hepburn is most noted for throughout the film and press.